At Gunsmoke Paintball we pride ourselves on offering excellent value for money and have a range of options for all budgets. For group bookings please either phone or email to discuss discount prices. If you have a group of 20 (or more) then the organiser goes for FREE!!!! Whatever the occasion (individuals, schools, youth clubs, paintball parties) we have the perfect package to suit everyone. Junior paintballers are the future of the sport and we do everything to encourage them to get to have a great time playing paintball. so we have special pricing for younger players. £30.00 Price inclusive of marker and equipment hire plus 500 paintballs. A deposit is required for all paintball bookings and this is non-refundable or transferable, remaining balance is paid on the day. Please note only paintballs purchased at Gunsmoke Paintball on the day can be used. Prices subject to change. No refunds on purchased items. Click here to download the consent form. 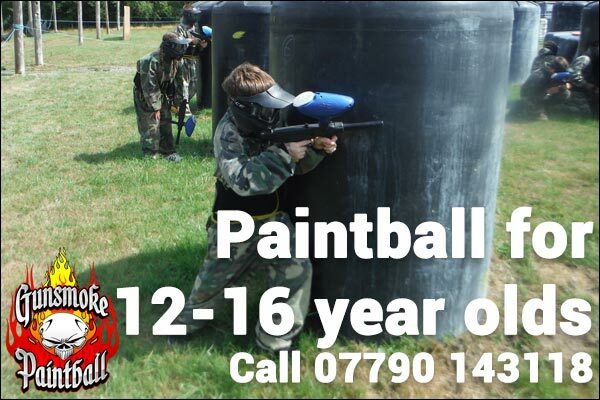 To book your paintball session, you can complete the contact form or alternatively call Julie on 07790 143118 or alternatively email Julie@gunsmoke-paintball.co.uk stating 12-16 year olds paintball booking.